Reusing plastic water bottles has direct environmental and financial benefits. If you wish to minimize waste and save money in the process, you must consume less and focus more on efficiency than on convenience. It requires a substantial amount of energy to manufacture, fill, ship, and recycle or destroy plastic water bottles. Washing and reusing plastic water bottles reduces waste and landfill crowding, minimizes pollution, and conserves energy. Refilling your plastic water bottle with tap water is considerably less resource intensive than purchasing commercially purified and bottled water. The reuse of plastic bottles has wide-reaching benefits on the environment. Every day, consumers discard more than 60 million plastic water bottles. These bottles litter highways, clog waterways, or end up in incinerators and landfills. Plastic in landfills can take up to 700 years to decompose. Meeting consumer demand for water bottles in the United States requires more than 15 million barrels of oil each year for manufacturing, transport, and disposal. That is enough oil to fuel approximately 100,000 cars for an entire year. Plastic bottles are one of the least recycled materials in the United States. The Recycling Institute states that only about one in six plastic bottles sold in the United States was recycled in 2004, or about 17% of all plastic water bottles bought by consumers. Reusing plastic water bottles means less need to manufacture new bottles from virgin petroleum resin, and less trash that ends up in landfills, streams, and parks. Reusing plastic bottles can significantly reduce pollution, greenhouse gas emissions, and energy usage. In addition to the environmental benefits of reusing bottles, there are also direct and indirect financial benefits. Reusing a plastic bottle that initially costs US $1.25 just ten times equals a savings of $12.50. Reusing that same bottle 60 times will save $75. If you purchase a single disposable plastic water bottle every day for a year, you will spend more than $450. Buying and reusing one bottle per year results in a significant financial savings. While the direct financial savings are the most obvious and substantial, reusing water bottles also provides indirect financial benefits. Reduced consumption of natural resources means lower monthly utility bills, and less strain on landfills and recycling programs may result in tax reductions or other savings. 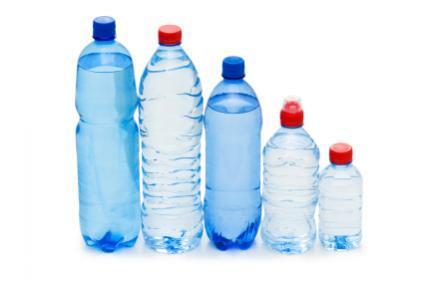 According to the Plastics Division of the American Chemistry Council, most beverage bottles sold in the United States are manufactured from polyethylene terephthalate, a type of plastic determined safe to use and reuse by the U.S. Food and Drug Administration. Reusing bottles without cleaning them encourages the growth of potentially harmful bacteria. It is essential to clean all plastic water bottles between uses, just like any other food or beverage container. When properly cleaned, plastic bottles pose no greater risk of bacterial contamination than glasses or mugs. Many plastic bottles contain a chemical called Bisphenol A, or BPA. This chemical is associated with a variety of health risks. Heating or bleaching plastic bottles may increase the leeching of BPA into the bottle's contents. Recent evidence suggests that PET, the type of plastic most commonly used to make plastic water bottles, may contain hormone-disrupting chemicals. Martin Wagner of Goethe University in Frankfurt states that these chemicals may potentially interfere with the body's natural levels of estrogen and other hormones. Most people reuse plastic bottles for storing water or other liquids. However, there are hundreds of different ways to reuse plastic bottles. A few ideas for reusing bottles are below. Cut the top off a bottle and use it to store pencils or art supplies. Use a plastic bottle as a piggy bank by cutting a slit into the top. Fill a plastic bottle halfway with water, and then place it in your freezer. The water bottle will serve as an instant ice pack. Use the top half of a bottle as a funnel, and use the bottom half as a plastic pot for plants. Fill a bottle with equal parts oil and water, add some glitter or food coloring, and decorate the outside. The water and oil will not mix, resulting in interesting designs during shaking or other movement. This is a fun project for children. While recycling plastic water bottles is certainly better for the environment than throwing them in the trash, recycling uses energy to process plastic into another usable product. Moreover, the recycling process produces wastewater and air pollutants. Reusing plastic bottles requires no additional energy expenditure and does not contribute to pollution. Ideally, it is best for the environment to avoid purchasing and using plastic bottles entirely. When you cannot avoid using disposable containers, you should reuse them as many times as possible or buy reusable water bottles. When you can no longer use them, opt for recycling the containers instead of throwing them away. This practice will ensure the greatest environmental and financial benefits.